Hey Im with Jess on this one. Hermione looks so defiant, and Umbridge- poisoned honey aplenty. Fabulous! Someone should have come up and kicked Umbridge right then. But yes, it very much shows the amazing contrast and tention between them. Fabulous! There is just some mental war going between the two, and Hermione looks great... stiff as a board! What a great idea! I've just re-read OoTP a week ago, and I especially enjoyed this particular scene. What's not to love about Hermione ot taking any crap? The visualisation is perfect! Hermione's defiant face in prifile, with the ugly toad hovering just inches from her, wonderful contrast. I just love Hermiones determined face... And this IS one of my favourite scenes from the books. I just love the tension in this picture. You really captured Hermione's determination and defiance very well. I have to comment on this one, because Hermione is absolutely fantastic here! Briliant!Yay for Herms, she's doing a good job looking defiant(well, you're doing the goo job, actually)! Good one! Wow! I've been casually browsing all the drawings until now, but I HAD to stop and comment on this one! It's superb. This is truly a Hermione moment. This is why I like her so much. She just wants to know the answer and Umbridge is just being terrible. I'll never forget this moment in the books. I love Hermione! 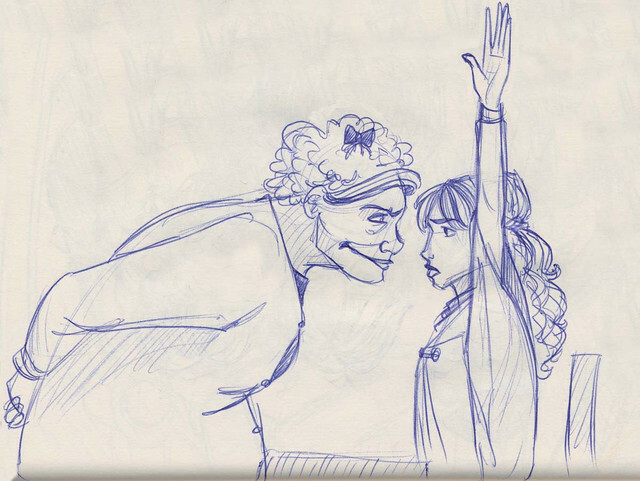 I love how close Umbridge is getting and Hermione isn't budging an inch! Fantastic! OMG! I just LOVE how you did Umbridge! Very "Toad like" Great Job! Now, I really love that one. Real withstanding. go hermione!!!!! A beacon of hope for smart girls everywhere! You couldn't make this better ! I loooooove this one ! Oooooh.... you can see how Hermione thinks the woman is absolutely ludicrous, and how she isn't intimidated in the least. Horrible as Umbridge is, she never could intimidate people who saw her for what she was. I also like how close Umbridge is to her... she has to be an inch away to see what Hermione is thinking... while dumbledore can see a person's soul from across a room. Huh. This is excellent. I can see the fluffy pink on the cardigan. I love this one,Umbridge looks like a big stupid toad !!!!! this is the BEST!!! The way Hermione's sitting straight without moving back when Umbridge put's her ugly toad face only inches away from Hermione's very pretty & defiant face really adds to the picture!!!! I LOVE LOVE LOVE Hermione. I think it's fantastic how she's grown confident enough in herself and her own beliefs and standards that she's not afraid to stand up to a professor....or that particularly miserable excuse for a professor. I love how in the book Umbridge seems impressed against her will. Go, Hermione!